MarLa studio: New Year. New chance. I can actually make quite a ruckus with this horn. It works. The ram's horn makes a most primal sound. I love it. I love when ritual is raw and arresting - when it shakes me from the mundane and demands attention. 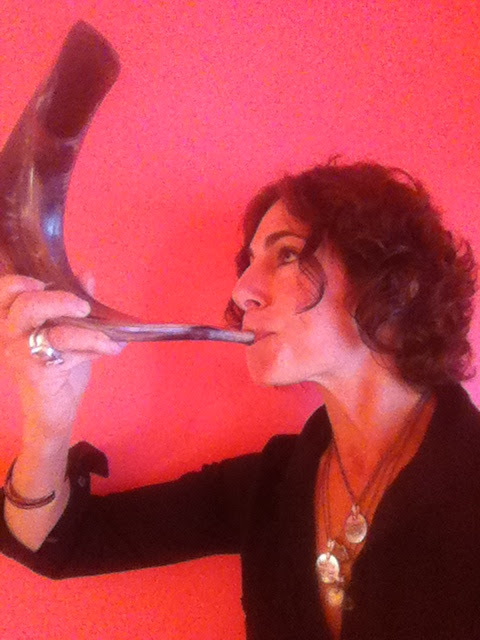 The peculiar and un-lovely sound of the shofar is perhaps what I race towards all year. Pushing through time and experience to return to the sound, reset, refresh the screen, and get another chance to try again. This is the ultimate, most precious gift for which I am beyond grateful. So very grateful. Another chance to try again and make it all count. Ok! Bring on the horns! A happy, healthy, sweet new year to all. Only you can turn a shofar into a cool, attractive accessory.